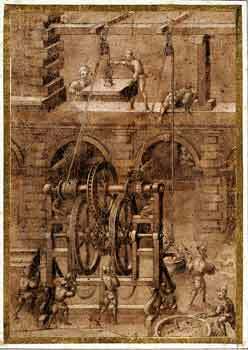 Original Drawings for Agostino Ramelli's Le diverse et artificiose machine (Paris, 1588). The military engineer Agostino Ramelli produced a remarkable illustrated book in 1588 describing a large number of machines that he devised. 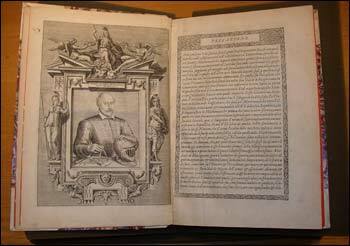 Called Le diverse et artificiose machine del Capitano Agostino Ramelli (The various and ingenious machines of Captain Agostino Ramelli), this work had a great impact in the field of mechanical engineering. The book contains 195 superb engravings of various machines along with detailed descriptions of each one in both French and Italian. The Dibner Library has original drawings of seven of the machines and this web site has been developed to further research on these artworks. We have on display here each of the drawings along with their counterparts in the printed book. Ramelli was born in northern Italy, probably in 1531. As a young man he served under the famous Italian warlord, Gian Giacomo de' Medici, Marquis of Marignano, and became trained in mathematics and military engineering. His reputation grew and he eventually left for France to serve under the Duke of Anjou, later King Henry III. His year of death is unknown and usually given as "circa 1600," but since documents exist to show that he was still alive in 1608, circa 1610 is a more realistic approximation. Ramelli was greatly influenced by the increasing importance placed on mathematics and geometry as an important tool for engineers and artists, and particularly by the writings of Guidobaldo del Monte (1545-1607) and Petrus Ramus (1515-1572). Ramelli's interest in mathematics is demonstrated in the preface to his book, "On the excellence of mathematics in which is shown how necessary mathematics are for learning all the liberal arts." Ramelli also wanted to make his book accessible to many engineers so, as an Italian living in France, he produced both Italian and French descriptions of the machines. The book itself is a fine example of the exquisite work of late sixteenth-century French printers and artists. It is a large book in folio format thus allowing great detail to be placed in the numerous engraved plates which total 195 in all (although plates 148 and 149 are combined into one image). Twenty of the plates are two-page spreads. Ramelli's bilingual descriptions are much more detailed than those found in previous illustrated books of machines (popularly called "theaters of machines") by Jacques Besson (Theatrum instrumentorum et machinarum, 1569) and Jean Errard de Bar-le-Duc (Le premier livre des instruments mathématiques mechaniques, 1584). Ramelli's book had a great influence on future mechanical engineering as can be see in Georg Andreas Böckler's work, Theatrum machinarum novum, 1662, where he copied eighteen of Ramelli's plates. Ramelli's influence can also be seen in the well-known works of Grollier de Servière (Recueil d'ouvrages curieux de mathematique et de mecanique, 1719) and Jacob Leupold (the multi-volume set Theatrum machinarum, 1724-1739). Leupold's work helped pass along Ramelli's ideas to a large population of eighteenth-century engineers. Only the one edition of the book was issued during Ramelli's lifetime. In 1620, a German translation appeared in Leipzig as Schatzkammer, mechanischer Künste..., published by Henning Grossen den Jüngern with the illustrations re-engraved by Andreas Bretschneider. A number of facsimile reprints have appeared since 1970 and in 1976 an English translation was prepared by Martha Teach Gnudi and Eugene S. Ferguson and published jointly by the Johns Hopkins University Press and the Scolar Press. This English translation has since been reprinted by Dover Publications and is now widely available. The seven drawings in the Dibner Library's collections came as part of the original gift from the Burndy Library. They are pen-and-ink and sepia wash drawings on vellum, highlighted with touches of white, mounted on eighteenth-century heavy paper. The drawings were originally attributed to Ambroise Bachot (and still are listed as such in the Smithsonian online catalog, SIRIS). The drawings have been assigned the local call number MSS 1604A. Bachot was an apprentice and assistant to Ramelli, eventually becoming an architect and engineer to King Henry IV. As described in Gnudi's introduction to her translation of Ramelli, during the sixteen years he spent with Ramelli, Bachot learned a great deal about engineering but had a falling out with the elder engineer and attempted to pass off some of Ramelli's machine designs as his own in an attempt to gain patronage. These designs were published in 1587 in a book by Bachot, Le Timon, and the similarity in style between Bachot's engravings and Ramelli's is impressive. After intense research, Gnudi concluded that Bachot engraved the plates for his own work and most of those produced for Ramelli's book as well. After their falling out in 1587, Ramelli still used the plates Bachot engraved for him rather than have them redone. Gnudi never claimed that Bachot produced the original drawings, but rather engraved the plates after Ramelli's drawings. The seven drawings in the Dibner Library are quite detailed and bear a tremendous resemblance to the final engraved plates as you can see by comparing them on this web site. The drawings are also not like the two simple pen-and-ink drawings bound in the incomplete proof copy of Ramelli's book which is in the Special Collections of the University of California-Los Angeles' Charles E. Young Research Library. The simple UCLA drawings were probably made to assist the engraver in copying the drawings onto a copper plate. The Dibner Library drawings are most likely done by Ramelli himself and part of what was a bound manuscript copy of Ramelli's work. One of the large drawings appears to show signs of having once been bound in a codex format. The art historian Gustina Scaglia believes that the drawings are by Ramelli since the buildings and people are more typical of Italian architecture and dress, which was quite different from the French style with which Bachot would have been familiar. Scaglia also feels that the drawings were prepared by Ramelli in Italy before he left for France.